I am Erik P. Kraft. 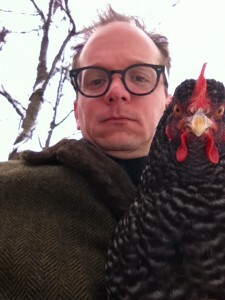 I write and illustrate children’s books, perform comedy, teach writing, and, you may have heard, keep chickens. I also draw this comic, and this comic. Me with Boss Chicken. (I’m on the left). If you’d like to contact me, email erik at too many chickens dot net.